Here are details on a couple more of the fairly easy dinners in heavy rotation in my kitchen — originally mentioned in the long and rambly Two dinners post. I am certain this update will be more to the point. Unless, of course, I get distracted again…. It happens. AND, it’s really easy to prepare (and the boys love it). 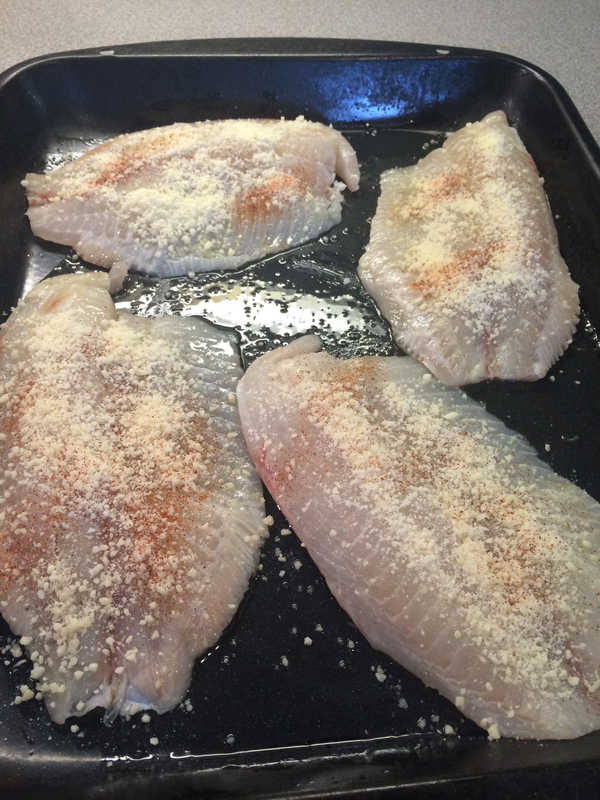 Rub the tilapia fillets with olive oil, S&P and a bit of garlic powder. Press some grated parmesan on top (gives it a nice light crust) and sprinkle with some paprika (or any other herb you like — I just like the pretty orangey-red color). Broil. Here I was dishing it up with organic brown rice and organic (frozen) peas. 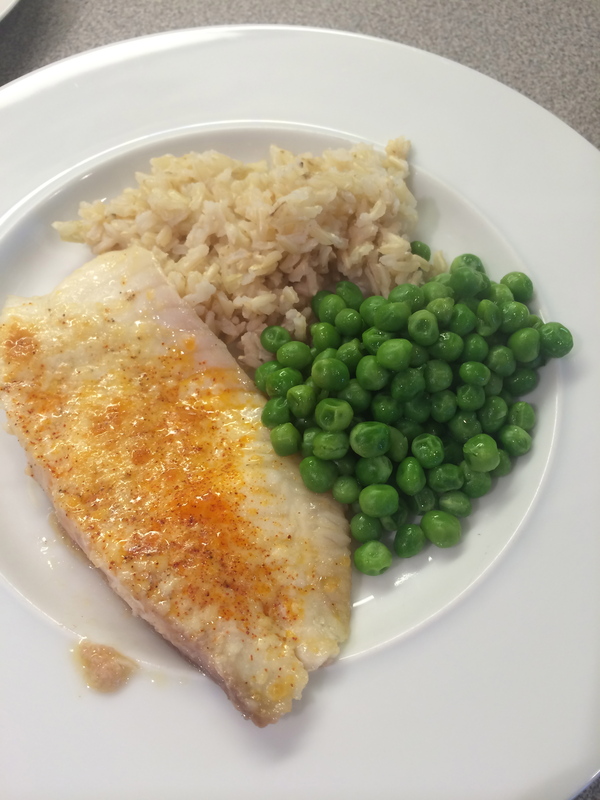 Start the brown rice, do the fish, steam or microwave the peas just before the fish comes out. As I’ve explained before, for some reason (note to self: “research etymology of ‘gravy’ for other blog), a lot of Italian immigrant families call tomato/spaghetti sauce “gravy”. I learned it from my inlaws 20+ year ago and I will forever call it that. As will my boys, I am sure. At least at home — anywhere else it does tend to confuse people (which is part of the charm/entertainment-value of using the word in the first place). I make a big pot of gravy every month or so. Freeze 3/4s of it. Make more when I pull the last container out of the freezer. So if you’ve got your gravy, this is a really easy one. Boil whole wheat pasta. 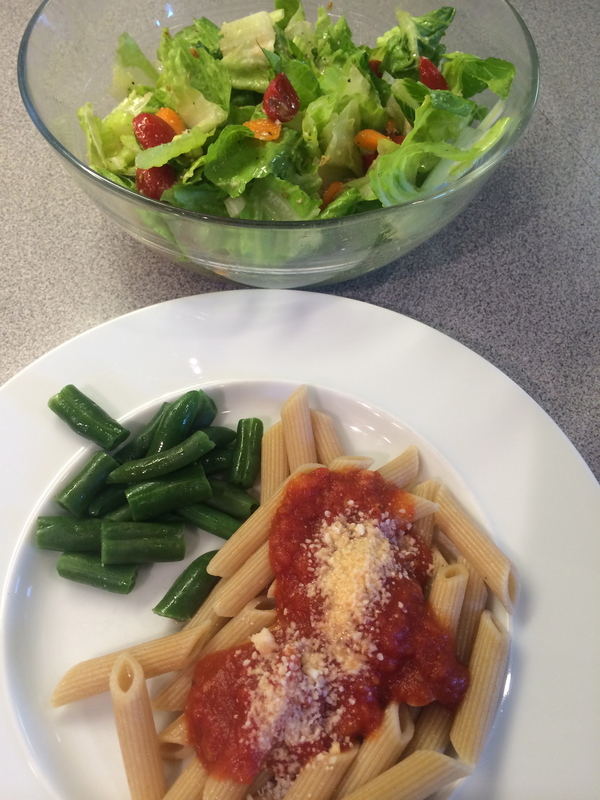 (I’m a big fan of Meijer Organics whole wheat pastas. I’ve tried some more expensive ones, but the boys and I prefer this.) Warm up gravy. Grate some parmesan. Steam or microwave some organic veg and … dinner. Oh – I made a little salad, too! I’m going to try the Tilapia recipe for sure. I usually make a spicy rub with chili powder that Gabby likes for fish tacos, but I’ll need to switch things up since she’s home for the summer. Lots of meals to make.